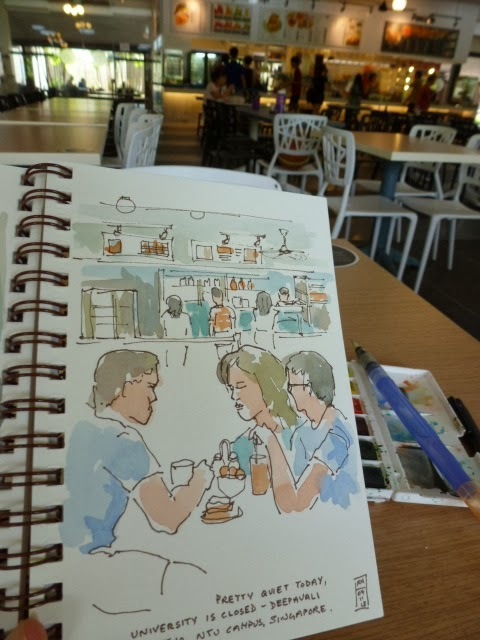 There are many restaurants on the campus of Nanyang Technological University, Singapore, including 16 canteens. The canteens are typically attached to Halls of Residences (10,000 students live on campus) but anyone can eat in the canteens. I have visited 5 and eaten in 4. Each has it's own ambience and selection of stalls. Prices are subsidized and a typical meal eg. the iconic Singapore Chicken Rice will set you back Sing$2.50. Albeit it's a small helping of meat by Western standards…and a big helping of rice. Disappointingly there are (in my opinion) too few Malay or Indian stalls. Most stalls sell Chinese food with some Japanese and Korean thrown in. The meals are such good value that people unconnected with the university also come to eat especially at lunch time, these include taxi drivers and tour bus drivers who irritatingly park their vehicles outside our apartment building. Find the Myna bird in the sketch above. We have discovered that Sunday mornings are very quiet in canteens (students are away or asleep) and staff and their families often come for breakfast. 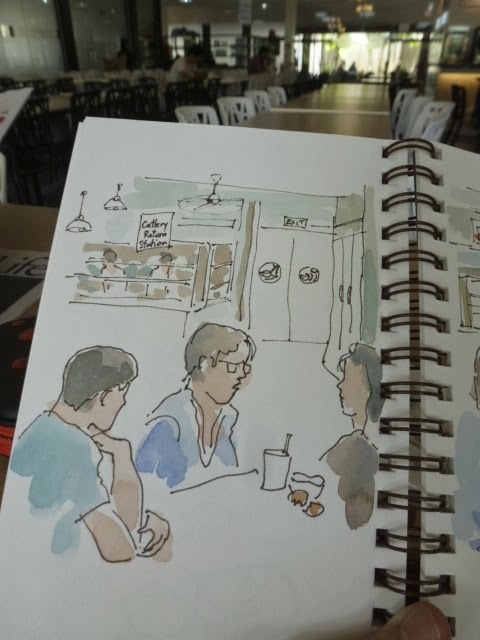 J often has a coffee and I do my sketching.